Seemingly, I have written a lot about bad fruit. The truth of the matter is that I don’t like waste and “spoiled” in the case of bananas may just be in the eyes of the beholder…because the bananas left uneaten after a long weekend away are perfect for the best banana bread of your life. My grandmother didn’t live through the depression and wasn’t cripplingly poor, but she hates waste as one whom has been without. Correction: she doesn’t just hate waste. She’s actually a hoarder…. like Buried-Alive Status. And, well, that’s ok—we’ve all got our issues. 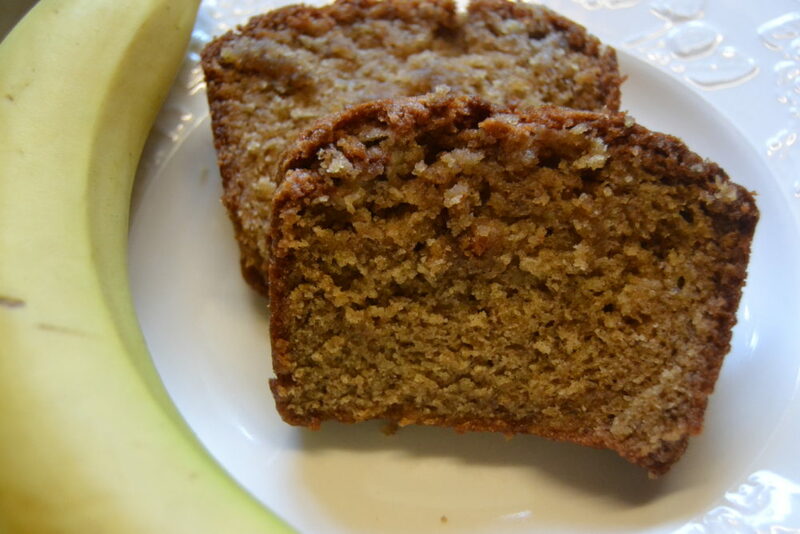 Currently, mine is this delicious banana bread. I’m really thankful Nan never tossed her vintage (circa 1956) Raceland Rams Marching Band Cookbook, as that is where I found this recipe. We had a nice weekend away at my parents’ cabin, and that inevitably meant that I needed to make some delicious bread with the uneaten, ripened bananas upon our return. 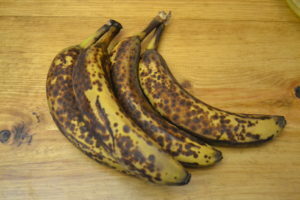 These 4 large bananas will make 4 banana breads– but for simplicity’s sake, I’ll give you the recipe for 2 breads…. (4 would overload the average mixer). Start by incorporating all of the dry ingredients together. 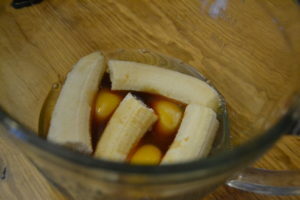 In a separate large bowl, gather all of the wet ingredients. 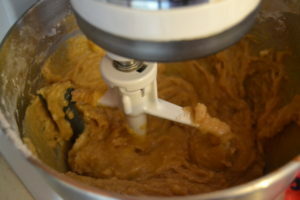 Add the wet ingredients slowly to the mixer and beat slowly. Now, you could add walnuts if you prefer. We leave them out due to the toddler. Pour mixture into aluminum tins and bake. I prefer to buy the disposable tins and freeze any breads we won’t be eating for up tot 6 months or give to friends/neighbors. When we are ready for the frozen breads, I just leave them out on the counter overnight and they are fresh and equally as delicious the next morning. Enjoy! Preheat oven to 350 degrees. 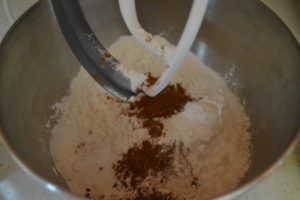 Mix dry ingredients. Mix wet ingredients. 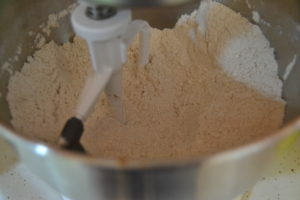 Add slowly to dry mixture. 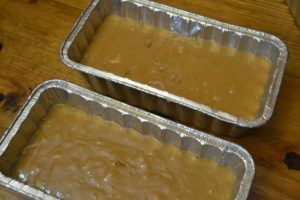 Pour into 2 non-stick bread pans 9″x5″x3″ (greased). Bake 50-60 minutes.